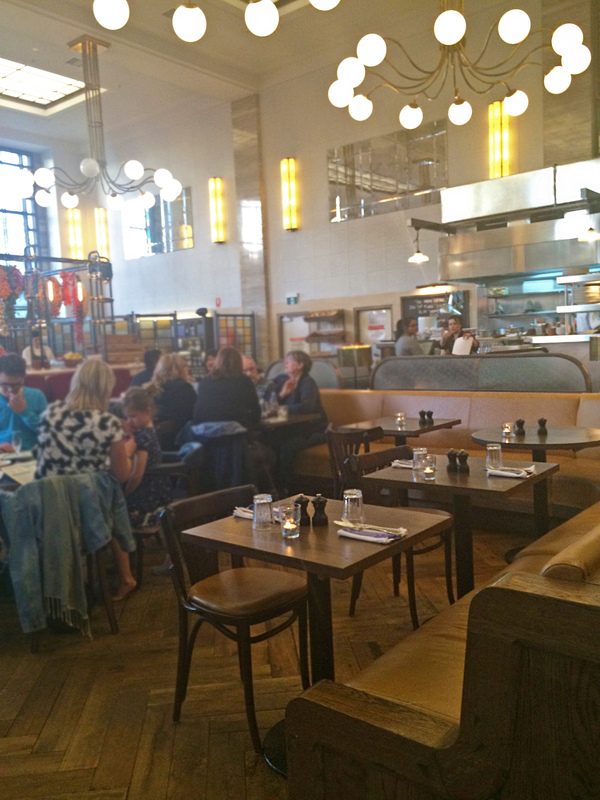 I love the feel of this restaurant, mainly because of the fact that the location is an old renovated bank. I love the decor and the general atmosphere. 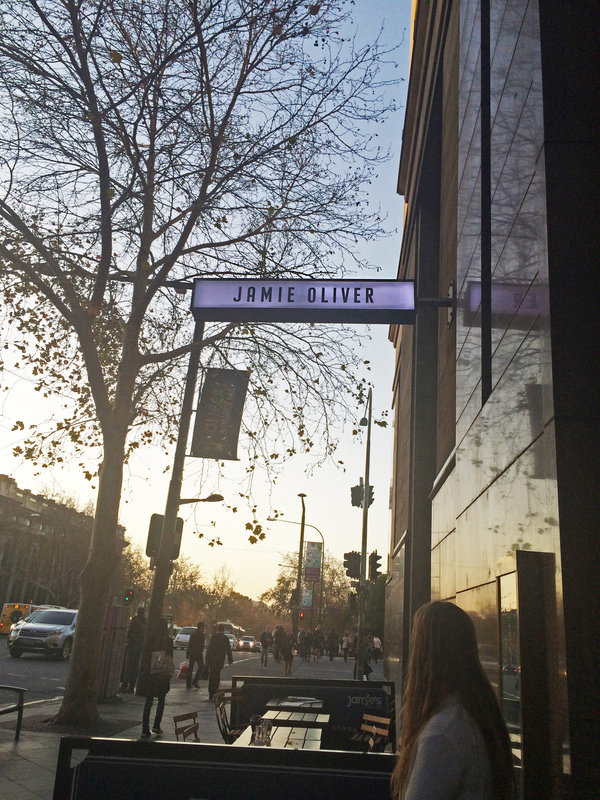 Also every time I have dined at Jamie’s Italian the service has been top notch, and this occasion was no exception. Our waiter gave us very detailed descriptions of the specials and even suggested a popular drink to try. 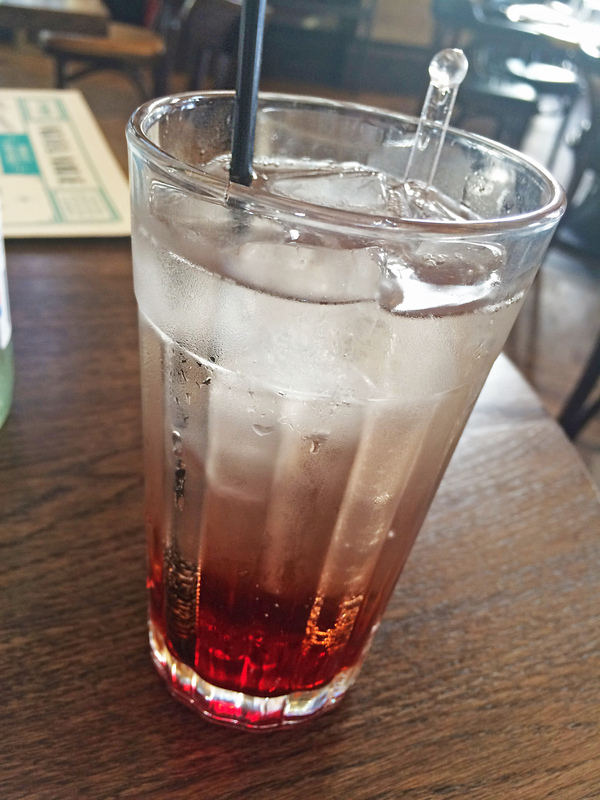 This was the Strawberry & Elderflower Soda & it was so delicious. The staff here are always friendly & very helpful. 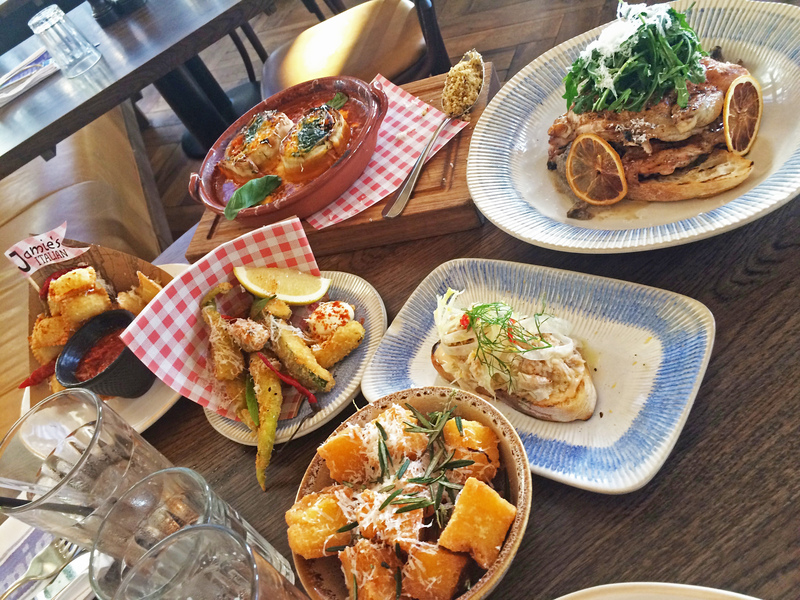 We admittedly went a little overboard with the ordering & ordered a dish from nearly every menu section; appetisers, sides, mains, pasta & desserts. 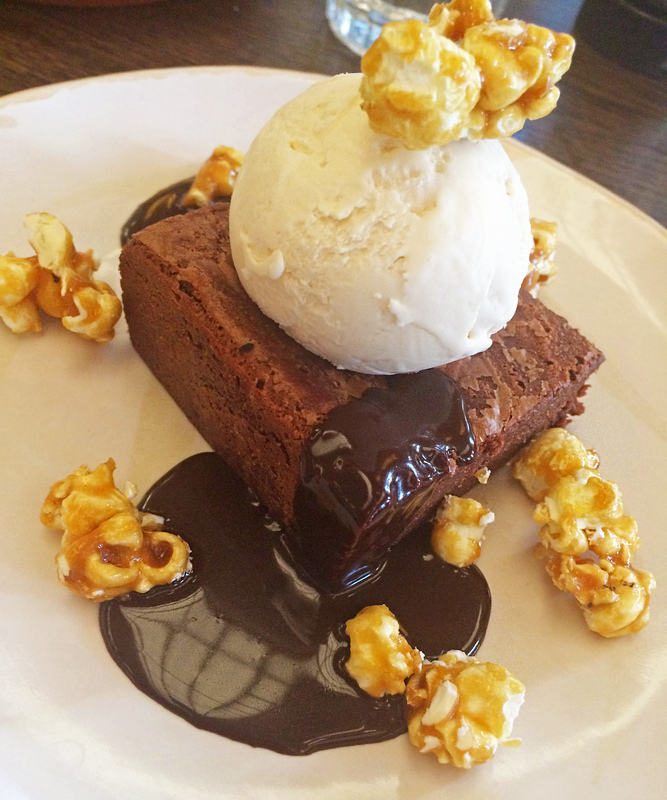 Luckily the food was delicious so we didn’t regret this decision & enjoyed sharing each dish. 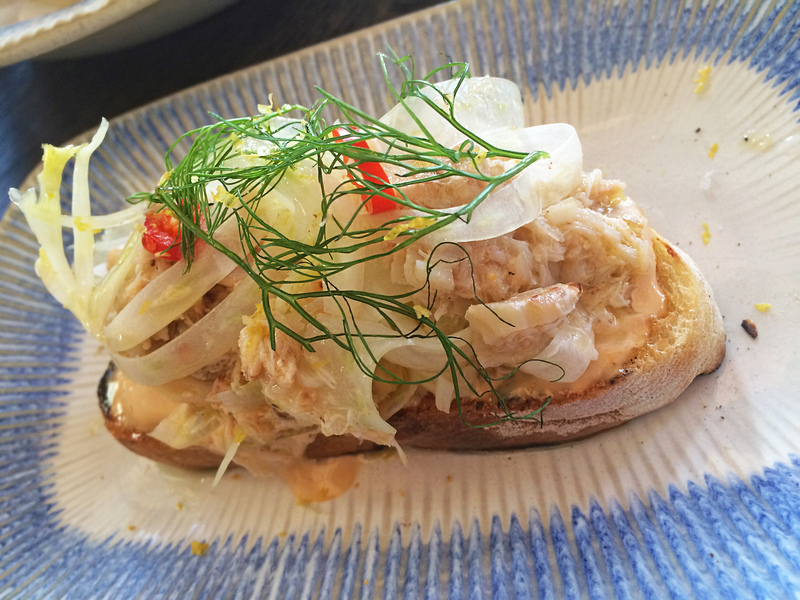 Our first starter was the Fresh Crab Bruschetta which was dressed with fennel, lemon & chilli. For $12 I thought it would have been nice to have two instead of just one bruschetta, but I guess crab is an expensive ingredient. This was my favourite starter as it was DELICIOUS. I love the combination of crab & fennel & I am not ashamed to say I licked the plate clean. Sooooo good. So I saw Italian Nachos on the menu & thought I’d give it a go since it sounded a little unusual. 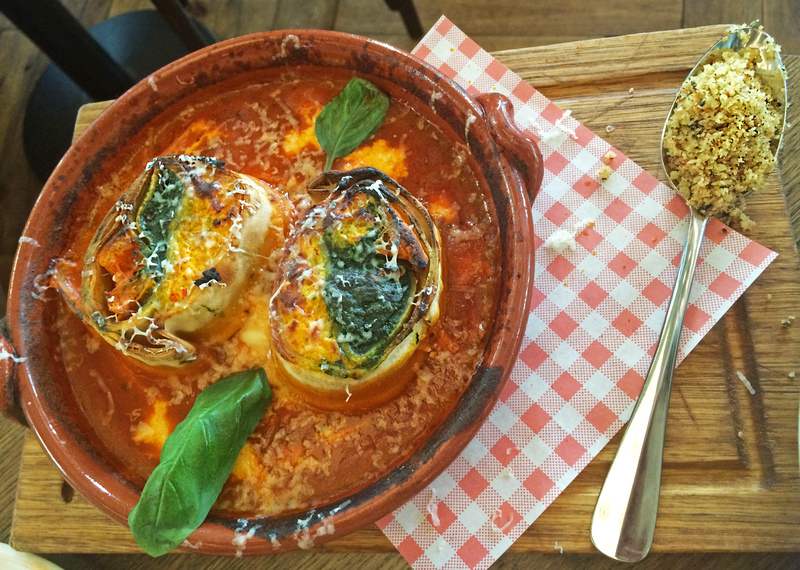 This was crispy fried ravioli stuffed with three cheeses, served with arrabbiata & parmesan. I like the cleverness of this dish & how it did remind me of nachos. The texture of the ravioli was kind of strange to me & the cheese filling inside the ravioli was lost, but it wasn’t completely unpleasant to eat. I did like the spice in the sauce. I wouldn’t order this again though. 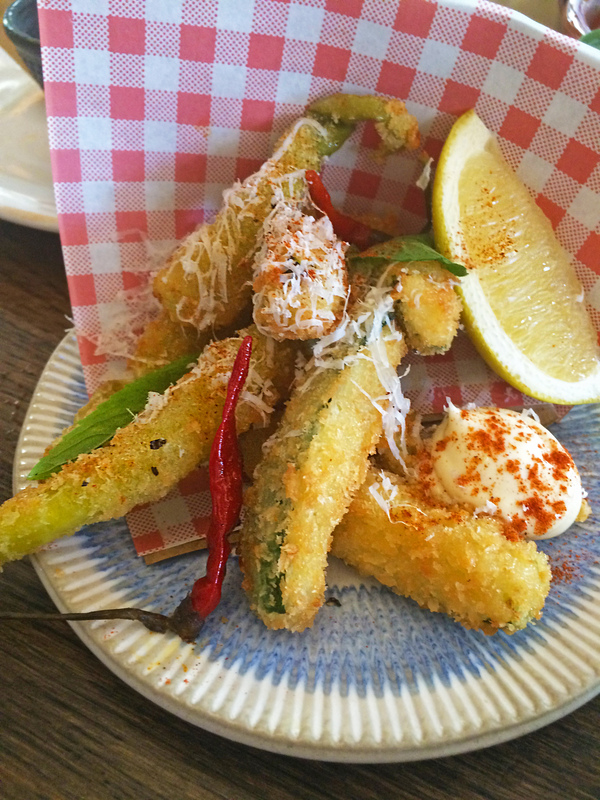 Next was the Zucchini Fritti which I was imagining to be a little different than what it was. They were battered & fried Zucchini which were nice & had a good flavour but nothing too special. They also lacked seasoning. I did like the addition of aioli. I have ordered Polenta Chips on each one of my visits as I love them so much & they have never disappointed! 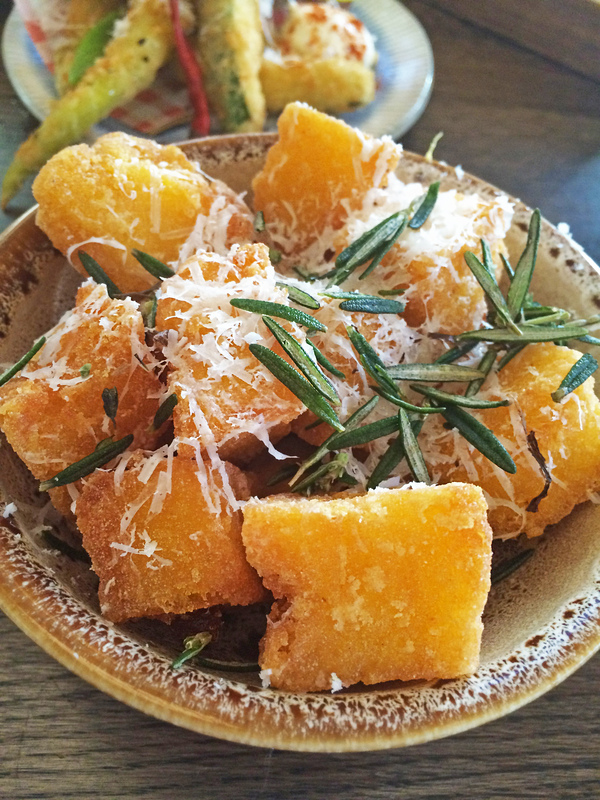 These are crispy fried with rosemary salt & Parmesan. A few times they haven’t been as crispy as I would like but on this occasion they were perfectly crunchy & seasoned. I cannot get enough of these. 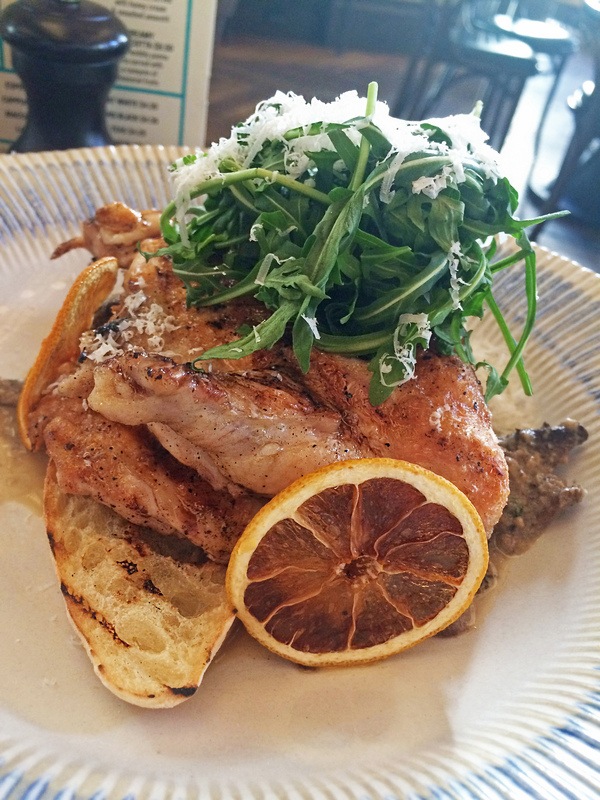 For main we ordered the Chicken Al Mattone which was Free-range marinated chicken with a creamy wild mushroom sauce, lemony rocket, crostini & Parmesan. I loved how the chicken was cooked as it was so moist and had a great lemon flavour to it. However it severely lacked seasoning which was a let down. Also as the crostini was served underneath chicken it went soggy which I really did not like. Who likes soggy bread?! Put it on the side please guys. Crunchy bread is the way to go. The creamy mushrooms were delicious, but again lacked seasoning. Adding a simple pinch of salt lifts a dish so much, I don’t get why this was lacking so consistently? Admittedly though, this second dessert appealed more to me on this occasion as it was a little lighter after the huge amount of food consumed. 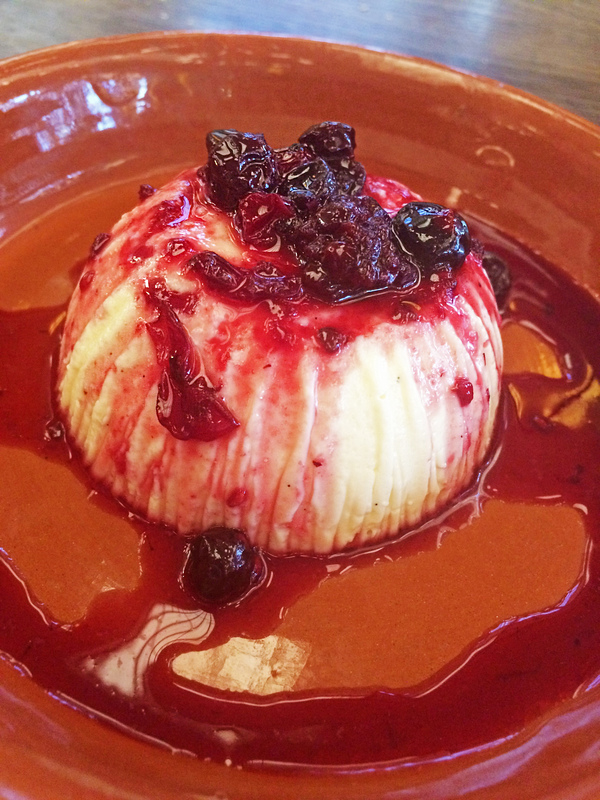 This Creamy Panna Cotta was served with a compote of seasonal fruits and was so delicious. So great to cleanse the palate. 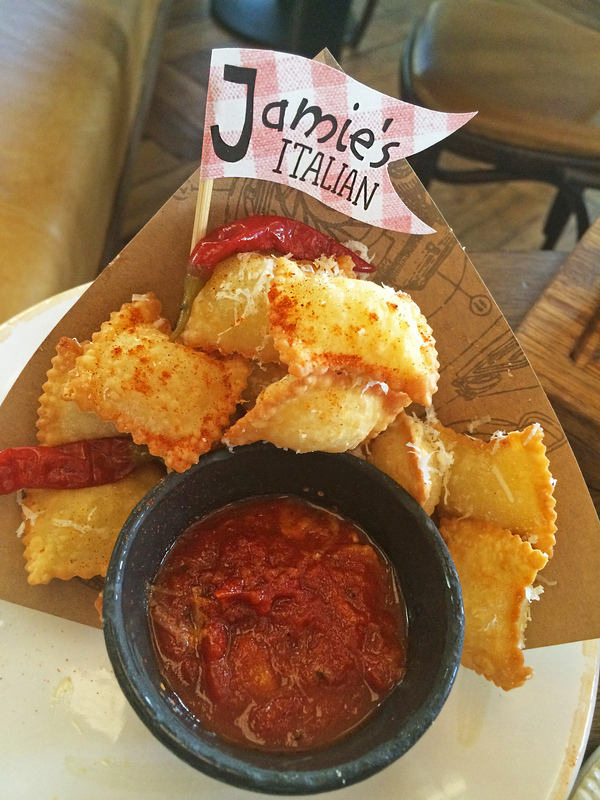 Jamie’s Italian is a definite winner if you’re looking to have a semi fancy & delicious lunch or dinner for a reasonable price. The total for all this food, desserts & drinks came to $130, which I think is pretty great! This visit I admit I was a little disappointed by some aspects, mainly being the lack of salt and there are some dishes that don’t quite hit the mark. But this isn’t something that will turn me away. Their great service, reasonable prices & AMAZING polenta chips are enough to keep me coming back.